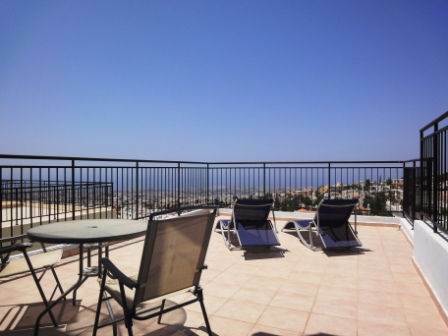 Cyprus Property Blog by Cleo : Bargain Studio Apartment For Sale in Peyia - ONLY 35,000 Euros with Sea Views! NOW SOLD! • 25 sq. m., 1 bath, 1 bdrm apartment "Studio" - €35,000 EUR - Sea Views - NOW SOLD! Peyia, Paphos - The properties are located near the popular village of Peyia, which has a wide variety of amenities including supermarket, shops, restaurants and leisure facilities. The best sandy beaches of the area are a few minutes’ drive away, together with the beautiful Akamas Peninsula know for its stunning scenery. There are four blocks in total on the project and the 10 studios being offered for sale represent one block. 5 are on the first floor and the remaining 5 on the top floor. The owner is willing to sell a studio individually, or a number of studios as a block investment. The price of the first floor studios is slightly higher due to the larger balcony (38,000 Euros), which can be seen on the photos. The project is in a very quiet peaceful location. From the balconies there are magnificent panoramic views of the Peyia area and coastline. The views from the front are of the well maintained swimming pool and open countryside, and are equally stunning. These properties are ideal as a rental investment or holiday home.